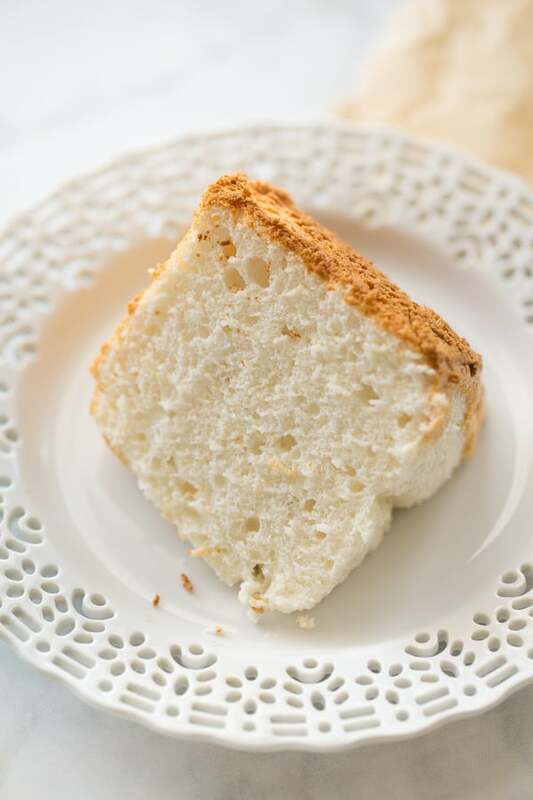 UPDATED April 2018: This is still my go-to recipe for angel food cake! People are always amazed this is gluten-free. I like using it in desserts like trifle or serving it on it’s own with berries and whipped cream. I’ve updated the recipe the way I’ve been making it lately with easier-to-find ingredients. Enjoy! 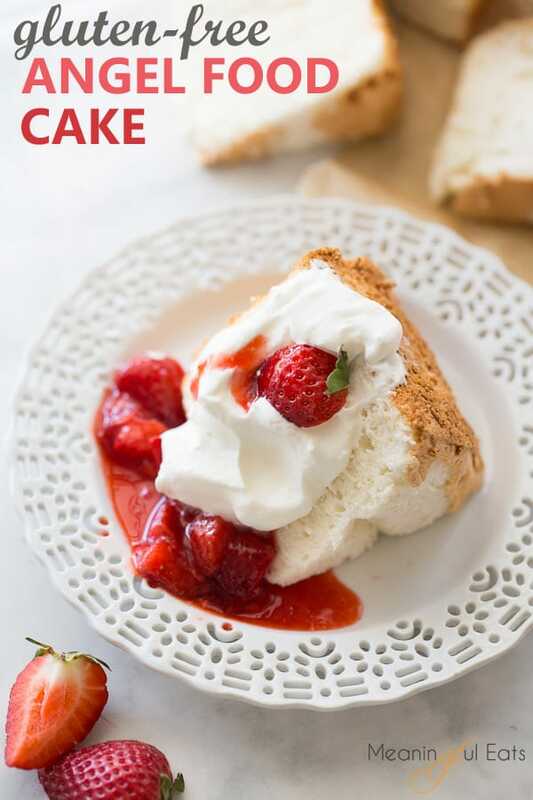 To me, angel food cake is more than just a vehicle for strawberries and cream. Angel food cake is what my Mom and I would make for birthdays every year. She would mix sprinkles into the batter and top it with my Grandma’s 7-minute frosting. If you’ve never had 7-minute frosting, imagine a cross between a fresh marshmallow and whipped cream. It is pure heaven on fluffy angel food cake! Angel food cake is also what gets broken up to make my very favorite Gluten-Free Strawberry Trifle. 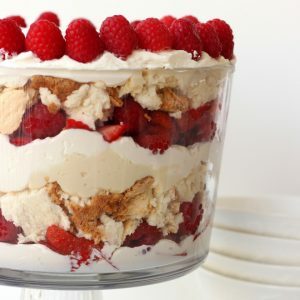 That trifle is probably my favorite summer dessert of all time. Every year my husband’s Grandma would make cherry and whipped cream fruit filled angel food cake for my mother-in-law’s birthday. I dearly love that cake too! And though it be humble, I do love the classic angel food cake with strawberries and whipped cream. 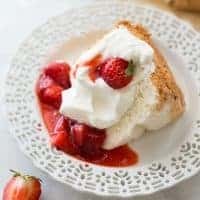 Since angel food cake is the key to so many favorite desserts, I need to have perfect gluten-free angel food cake in my life! This recipe is the one. 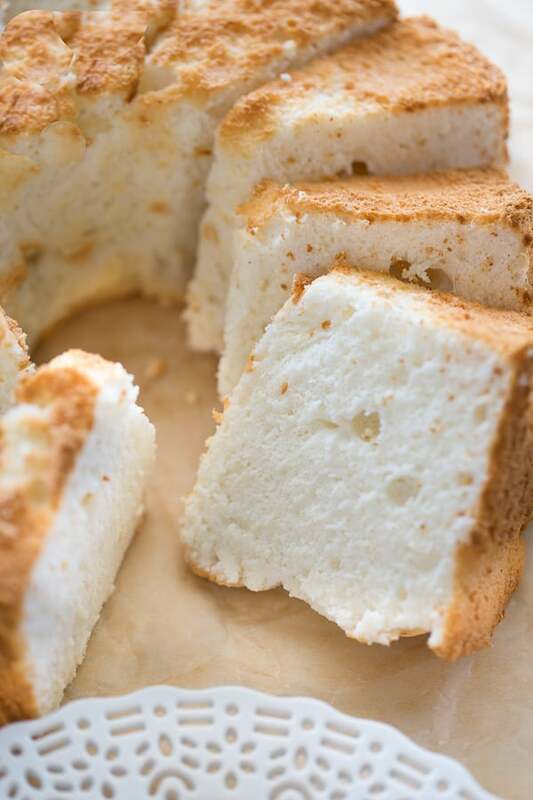 Since angel food cake gets it’s structure from egg whites, it is really easy to make gluten-free. It is moist and light with great height and flavor. I actually love this cake because it tastes a little more special than the regular box cake everyone is used to eating. You can tell this cake is made from scratch, making it extra delicious. But nobody will ever guess it’s gluten-free. Since there are a few steps I’ve made a visual tutorial for you all. I hope it is helpful! 1. In the bowl of a food processor, process the flours and powdered sugar together until smooth, about 30 seconds. 2. Sift the flour/powdered sugar mixture into a bowl and set aside. 3. Process the granulated sugar slightly, about 5-7 pulses. You don’t want to turn it into powdered sugar, just a little finer than it is normally. Set aside. 4. 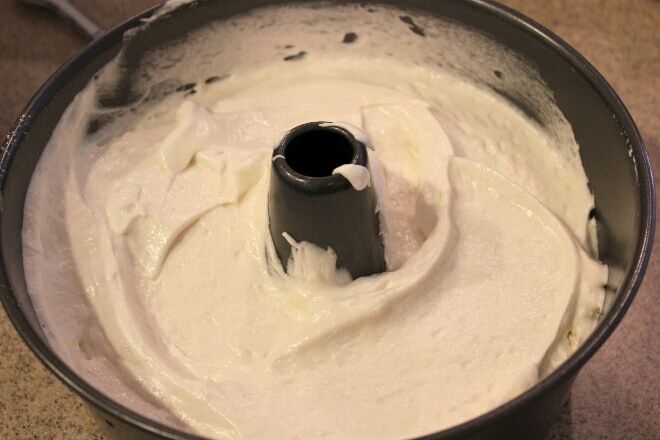 Place the egg whites (that should have sat at room temperature for at least 30 minutes) in the bowl of a stand mixer. Add the salt and cream of tartar and beat until starting to foam. 5. Add the vanilla and almond extract and continue whipping on high speed. 6. Add the granulated sugar slowly, about 2 tablespoon at a time to the egg whites while they are whipping. 7. Continue whipping until stiff peaks form. 8. Slowly fold in the dry ingredients 1/4 a cup at a time with a spatula. Do this carefully and slowly so you don’t deflate the egg whites. This is the key to good angel food cake! 9. Scoop in a ungreased, 10-inch round pan. 10. Bake at 350 for about 45 minutes until lightly golden. Immediately invert pan onto a cooling rack when you remove it from the oven. Cool completely then run a knife along the edges of the pan and carefully plate the cake. Enjoy! 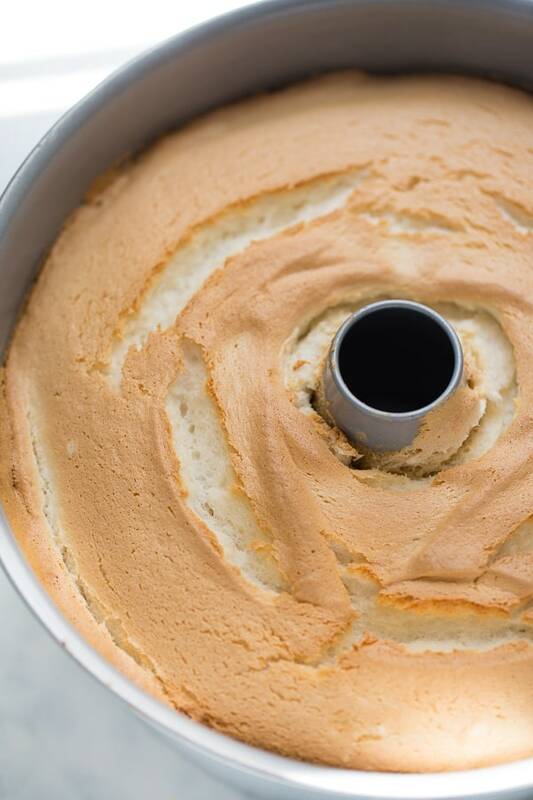 You won't believe this delicious Angel Food Cake is GF! Separate the egg whites and allow them to sit at room temperature for at least 30 minutes. Preheat the oven to 350. In the bowl of a food processor, process the flour, cornstarch and powdered sugar together until smooth, about 30 seconds. Set aside. Process the granulated sugar slightly, about 5-7 pulses. You don't want to turn it into powdered sugar, just a little finer than it is normally. Set aside. 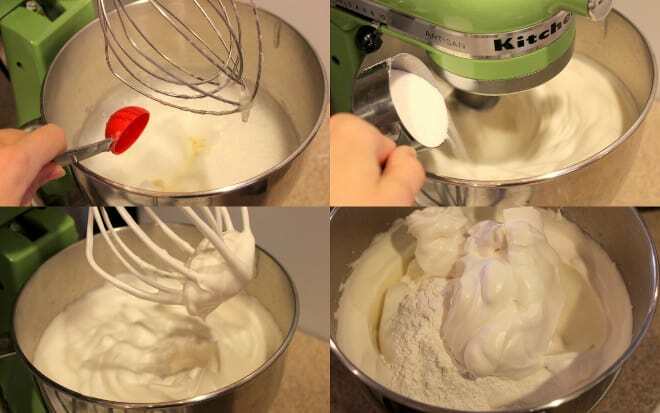 Place the egg whites in the bowl of a stand mixer. Beat on high until starting to foam then add the salt and cream of tartar. Add the vanilla and almond extract and continue whipping on high speed. Add the granulated sugar slowly, about 1 tablespoon at a time to the egg whites while they are whipping.Continue whipping until stiff peaks form. Slowly fold in the dry ingredients 1/3 at a time with a spatula. Do this carefully and slowly so you don't deflate the egg whites. (This is the key to good angel food cake.) Scoop into a ungreased 10-inch round pan. Bake at 350 for about 35-40 minutes until lightly golden. Immediately invert pan onto a cooling rack when you remove it from the oven. Cool completely then run a knife along the edges of the pan and carefully plate the cake. Enjoy! Previous recipe used 1/2 cup brown rice flour, 1/4 cup + 1 tablespoon tapioca starch, 3 tablespoons potato starch for the dry ingredients. This will still work great! You can use any gluten-free all-purpose flour blend you like in this recipe. I like using this one from King Arthur Flour or this one from Bob's Red Mill. Use this angel food cake to make all your favorite desserts gluten-free! Erin, your angel food cake really does look perfect! 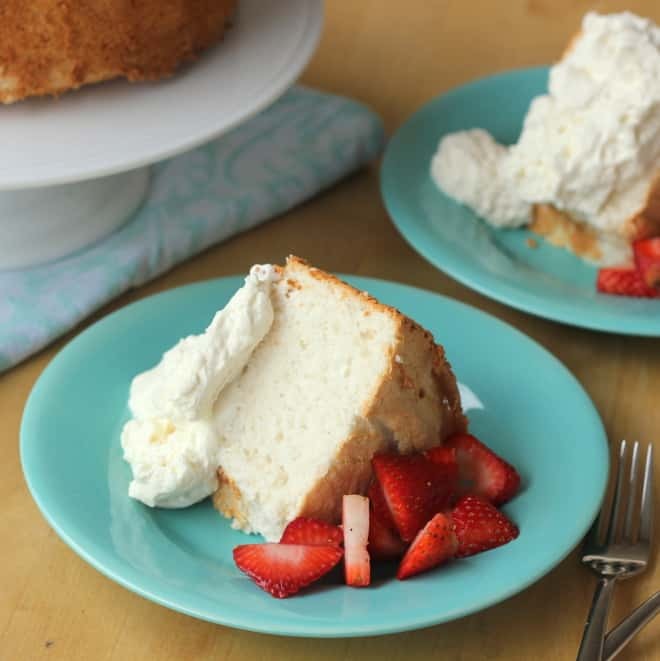 I have never made angel food cake, but I may just have to try yours! Hi Sallee! I can’t believe Noah is 1! I hope the trifle turned out for you! Most of my almond extract ingredients lists oil of bitter almond. Does the oil effect the cake as I know that no oil should come in contact with an angel food cake recipe. I didn’t think of this! The extract didn’t seem to effect my cake though. Great Job Erin! I needed this recipe as a base for a gluten free Tiramisu’! I would to see that recipe! This looks divine but would it be okay to replace the brown rice flour with regular all purpose GF flour? Yes you could try that! I think that should work. This cake turned out beautifully! Wish I could post a photo I made it a double decker with amaretto whipped cream and strawberries. It was a great recipe, thank you!! Made this cake last night for my sister’s 40th birthday. It was delicious! Growing up her favorite birthday cake was Angel Food, but neither of us had tried to replicate one gluten free. Thank you! We topped ours with chocolate ganache and served it with fresh strawberries and whip cream. I’m so glad you liked it! Sounds delicious! WOW!! i just made this cake, turned out just like a “regular” glutonous angel food cake, tasted the crumbs and they taste fantastic. Am going to make the 7 minute frosting for this!! TYTYTYTY FOR THIS RECIPE!!! I forgot to add that I am at over 9200 ft – yep very high altitude and I did not make any adjustments and it was wonderful! 7-minute frosting is one of my favorite things to put on angel food cake too! Glad you enjoyed it! would it be okay to substitute the tapioca starch with arrowroot starch? the recipe looks wonderful! Oh my goodness!! I have never made an angel food cake before. I can cook, but I usually can’t bake. Admittedly I did have to try it twice, but no fault of the recipe, faulty bakeware was to blame… but I did it!! It is great! Tastes amazing!! Thank you!!!! 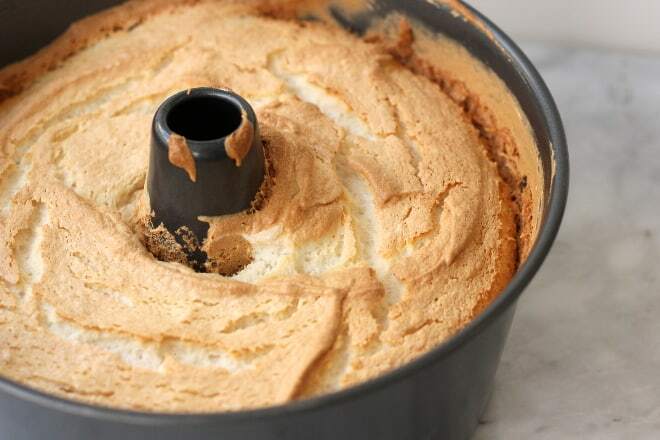 Would love to make this GF angel food cake for my dear friend’s birthday. 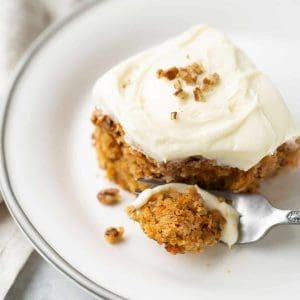 Would you be willing to share your 7 minute frosting recipe (please)? I did not see it on your site. Thanks so much! Hi Christina! Yes! It’s 1 1/2 cups sugar, 1/3 cup cold water, 2 egg whites, 1/4 teaspoon cream of tartar, and 1 teaspoon vanilla. In the top of a double-boiler, combine the sugar, water, egg whites, cream of tartar, and a dash of salt. Beat for 30 seconds on low with an electric mixer. Place over boiling water (upper pan should not touch the water). Cook about 7 minutes while boiling constantly and beating with the mixer on high speed. It will form stiff peaks when it’s done. Remove from the heat and beat in the vanilla. Beat for another 2 minutes. Then frost the cake! I hope you and your friend enjoy it! No it is just for flavor! Feel free to skip it. Could I just use the regular Corn Starch to replace the tapioca and potato one? I haven’t tried it so I couldn’t say for sure. It might work though! Did regular corn starch substitution for tapioca starch work out? just made this for father’s day, my adorable nephew NJ has been gluten free due to allergies for the past year and I hate when he gets left out of the goodies during the holidays so I always try and make something yummy for all to enjoy! it looks and smells delicious and so easy to make! I don’t suppose you could sub carton egg whites for the egg whites? I’ve never tried it so I couldn’t say! Sorry about that. I have and they worked just fine! Thank you!!! This is our new go-to GF cake when we are entertaining. We’ve made it 5 times now and it’s always perfect. So delicious, and useful for crowds that include non-gf people because they can’t tell the difference. Absolutely wonderful cake. My daughter had brought mini store bought angel food cakes for the gluten eating people. They all ended up eating the cake and throwing out the store bought ones. I used the carton of egg whites I also use them for pavlova too, they work great and so much easier. This is great to hear! Also so good to know about the carton egg whites. Thanks Lynn! We have made this twice now. The first one was cooked in a preheated 350-degree oven for 45 minutes. When the oven was opened, the cake had shrived up and separated away from the pan. We made this cake a week later. The second cake, we put it in the oven for 30 minutes. It looked spectacular and the stick test came out dry. As we took it out of the oven it started to come away from the sides of the angel food cake pan. When turning it over on to the bottle, the whole cake fell out of the pan and collapsed. All the ingredient preparations were done correctly for both cakes. We really would like a successful cake with this recipe; please may we have your suggestions. Hi Gretchen! Sorry you’re having trouble with cake. I can think of a few things that would cause this. Are you greasing the pan before you pour in the batter? Any remnant of fat (even from a little egg yolk) will make it fall. Also angel food cake is better a little over-done that underdone, so I would err on the side of more cooked. If you’re using the convection setting to bake, it might not be done all the way in the inside and cause it to fall. Are you baking at altitude? That could also effect it. I hope you can make it work! I made this cake! My family loved it. My aunt is gluten free so I made this for everyone to enjoy on Easter Sunday. You cannot use liquid egg whites. It says so on the carton. I used them on saturday night and I almost had a nervous brake down because my cake came out horribly wrong. I had never made an angel food cake before or eaten one so I had no idea what it was supposed to be like. I had to wake up super early on Sunday to make it with fresh egg whites. Separating egg whites is fairly easy and kind of fun, so don’t be scared. I would give this recipe five stars. Very delicious. Thanks Ashley! I haven’t tried it myself with the carton egg whites so I’m glad you reported back about this! I’m glad you tried it again and it worked out! I made this today (my first time ever making angel food!) and it was AWESOME! Like the previous commenter, I used carton egg whites, but unlike her mine turned out fine! Maybe different brands act differently? I just checked my carton and it does say they’re not recommended for angel food, but I couldn’t tell a difference from fresh when I was whipping them. I could have gotten them a little stiffer, but that was my fault, not theirs. 🙂 The cake still turned out great. I served it with the first strawberries of the season and it tasted just like I remember from when I was still eating gluten. Delicious, and definitely a keeper! Thank you! Thanks Josie! What brand of egg whites did you use? I’m glad it turned out for you! Hi, and thanks for the great recipe! I followed it as written, except that I had to substitute sorghum flour for the brown rice flour (I live in Hawaii, and some things are just hard to find in a pinch). It came out great. Really delicious. The only thing–after allowing the cake to cool upside down on a bottle for an hour and then separating it onto a plate, there was 1/4″ hard gelatinous/plastic-like layer at the bottom (now the top). It came right off but was the weirdest thing. I tasted it, and it was sweet–kinda tasted like the cake but in plastic-y form. Do you know what this is or what I might’ve done wrong? Like I said, the cake is delicious and wasn’t affected at all (so it seems)–I’m just confused by the plastic ring. what a wonderful recipe. this is my daughter’s favorite birthday cake. thanks so much. Do you think I could replace the rice flour with coconut flour? Hi Amy! Unfortunately I don’t think so – coconut flour has really unique properties and easily makes things dry. Oat or sorghum flour would be the best substitutes. Are you trying to make it grain-free? I would try arrowroot powder if so. No, I’m just trying to avoid a trip to the store and use what I have in the house 😉 But thanks for the heads up re: coconut flour! Also, what’s your favorite kind of “all purpose” blend for gluten free baking? I’ve been using bob’s, but find it a little gritty and dry sometimes. Haha. Maybe I should’ve poked around on your site a bit more. Found your recipe for all purpose blend. Can’t wait to try it! I use this recipe all the time. I love it. I’ll stick with the original because I’m allergic to corn. Thank you so much for having gf recipes that actually work and taste good. You are my go-to site for my gf lifestyle. How long will it take for the eggs to form peaks? Feels like forever! Has anyone ever used egg whites from the carton? Made this for my daughter in law, who absolutely loved it. Can i use liquid egg whites? That won’t work unfortunately!The cornstarch is used to lighten up the flour mixture. Angel food cake is my boyfriend’s favourite cake. I’m going to make this for his birthday this Sunday which is also Father’s Day. Do you use organic cane sugar as the granulated sugar? And do you make your own powdered sugar from organic cane sugar? Look forward to your reply! I’m in the middle of making your GF angel food cake with all purpose gf flour. Your recipe calls for corn starch but the instructions does not have corn starch in it any. Probably won’t get my answer very soon, huh? So sorry! You add it along with the flour in the food processor. The BEST!! I also used carton egg whites, it was fantastic. I impressed my self 🙂 First time making angel food cake. Needs no topping. I believe this was my very first attempt at making a gluten-free cake. I used the egg whites in the carton, followed the directions exactly, and the cake turned out great. I do not have an angel food cake pan so I used two different sizes of spring form pans which meant I needed to adjust the baking time a little. I got great results. I cooled the cakes upside down as directed. The cakes pulled away from the sides of the pan easily when completely cool and were easy to transfer to cake plates. I should note that while the cakes rose, they didn’t rise a huge amount. Even so, they came out light, airy and nicely browned. Be careful not to overbake. Would the gluten free recipe for the angel good cake work as a jelly roll rather than the cake? Unfortunately I don’ think so! I’ve never tried that before. I made this since I have chickens and did not know what to do with all the eggs, LOL! My daughter picked this recipe. I used Bobs Red Mill 1 for 1 GF flour and it turned out great EXCEPT i had a hard time getting it out of the ungreased bundt pan. Otherwise, besides it looking terrible, tastes great and not even GF. My mom always inverted angel food cake onto a wine bottle to that it would not deflate at all. I am so excited to try this recipe!!!!! I am so excited about this recipe. You serious can’t even tell this is gluten-free. Definitely a favorite summertime dessert. Loved this cake! Question, I would like to make it less sweet and put a sweeter topping on it. 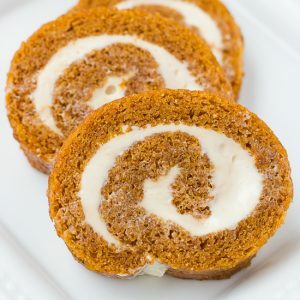 If I cut back on the sugar, do I need to add extra dry ingredients like GF flour? Do you think tapioca or arrowroot flour would work as a substitute for cornstarch? For us folks who can’t eat egg whites, might there be an alternative? There isn’t anything that will work in place of the egg whites unfortunately! What if I wanted to make one with no rice, no corn, and no potatoe? Can I use tapioca and oat flour for the gluten free flower and arrowroot for the corn starch? Or should i use tapioca starch in place of corn starch? I was wondering if you know if this can be transferable to cupcakes? And if so, what the temp and time would be? Thank you!! Will a mixer do the trick? Perfect recipe! I just baked my cake and ate a slice plain and it was so soft, light, and tasty! Better than gluten filled. This was so great! Thank you for the wonderful recipe. We ate it all in one night for my daughter’s 19th bday! Do you have a link for your 7 minute frosting or is that a family secret? Thanks so much!! A lot of people with celiac disease also have a corn allergy. Very common. Myself included. So many Gf recipes call for cornstarch…I never know what to replace it with. Maybe you can help. I have passed up so many recipes b/c of not knowing what to use instead..
OMG! That Angel food cake looks amazing!! This is a wonderful recipe! I will definitely be making this again. I used King Arthur gluten-free all purpose flour and followed your revised recipe. Thank you!! Want to know how much someone loves you?? Ask them to make you this cake without a stand mixer! WHEW!! LOL Smells wonderful, can’t wait to taste it! Hi, Kelly. Do NOT grease it. The reason being is that the cake has to crawl up the sides of the pan and stick during baking. If it doesn’t, you’ll get a flat something-or-other! The cake is to light and airy that you won’t have a problem ‘unsticking’ it from the sides when it is done and cooled. I hope this helps! My son is making the angel food cake for my birthday. We had problems at first trying to figure out what flour to use. The recipe say All Purpose gluten-free flour, but the link for Bob’s Red gluten-free flour is 1 for 1 Baking gluten-free flour. There is both kinds. The All Purpose has nut flours in it. We are going to use the Baking gluten-free flour. Hope it turns out ok.
Oh my goodness – best gluten free cake I’ve made. Thank you so much for the recipe and videos!! We served it with blackberries, raspberries and fresh whipped cream. Do you know how to change the recipe into a keto friendly recipe? I’m specifically asking about the flour. Is there a combination of almond flour/coconut flour or something else that could be used? Hi Angela! Unfortunately I don’t know how to make this keto. Sorry about that!